How Does A Motorhome Lead Acid Battery Work? "Allan, I ordered 2 new batteries, installed today and what I thought was a faulty Reich e-Box is now working well. You were right, battery condition is everything. Some people want to understand how a battery works so they can make an informed purchase and give it the ideal care to prolong it's life. Often after experiencing a failed battery. One of the most common questions they want answered is why did their battery fail? We will therefore start at the opposite end to most explanations and cover why batteries fail and the most common causes, then gradually make our way back to how they work. First of all a battery doesn't generally suddenly 'Fail', it deteriorates slowly over a period of time, gradually losing capacity until it's capacity falls below the industry definition for an acceptable battery. Each time a battery is charged and discharged (a charge/discharge cycle) a little bit of the battery capacity is lost, this applies to all Lead Acid batteries : Wet, Gel and AGM. So a battery eventually loses capacity until it becomes 'Exhausted', when only 80% capacity remains. The industry regard a battery as having reached End Of Life (EOL) at this point. Even though it may hold it's charge and perform normally in all other respects, it will have the capacity of a smaller battery. This gradual deterioration is typified when you hear someone say, "the batteries used to last 3 days off grid but now I only get two days". A battery normally only 'fails' if used beyond this 'Exhausted' point. To avoid confusion between a battery that has become exhaust and one that has been used right up until it suffers a structural defect, we are going to adopt 'Exhausted' as a term to describe EOL from deterioration of the Paste/loss of capacity below 80% and use the term 'Failed' to describe a physical battery breakdown. For example, continued use of the battery until 'structural' failure occurs like Paste shedding (causing shorting and faster self discharge), excessive corrosion, plate warping, Antimony poisoning Sulphation, etc. Trying to keep a battery going beyond the industries definition of EOL, is when issues occur with the charging systems. For example on each discharge, a typical 100Ah quality wet battery might lose 0.2Ah so drops to 99.8Ah capacity on the first discharged. So by the time 100 cycles have been used, the battery may be down to 80Ah capacity. By 200 cycles, it may be the equivalent of a 60Ah battery, with just 10Ah available, so long as it is not discharged beyond the recommended maximum 50% DOD or 50AH remaining. Clearly taking 40Ah out of a battery that is effectively only 60Ah capacity is going to leave just 20Ah in the battery so effectively an over discharge to a very deep 80% DOD. The above examples are not exact and scientifically accurate, as many factors affect how a battery performs, but it does provide a good guide. This next bit is our own theory were so many owners report the battery, "suddenly failing"
Once a battery gets below 80%, further degradation is accelerated, purely because the owner is used to drawing 50Ah from a 100Ah battery, except now they are drawing 50Ah from an '80Ah' battery which effectively amounts to a deeper 70% Depth Of Discharge. In a very short space of time the battery might be down to 65Ah real capacity, so the drawing of the same 50Ah they are used to draw is more likely to cause accelerated damage, because the Depth Of Discharge is effectively a very punishing 85% DOD. "A reduction to 80% of the rated capacity is usually defined as the end of life for a lead-acid battery. Below 80%, the rate of battery deterioration accelerates, and it is more prone to sudden failure resulting from a mechanical shock or a high discharge rate. Note that even under ideal conditions, a battery is expected to eventually wear out". Different technology batteries lose capacity at different rates, but just as relevant, in our experience, is the quality of a battery. From all the work we did in cutting open all types and makes of battery in 2012 and 2013 to see how they had fared in use, it was clear that budget batteries deteriorated much faster. They also had a greater tendency to suffer early structural failure. For example, in the 'budgets' Corrosion of the Plates becomes a serious issue within a few months of heavy use. The general trend is for many people to continue using batteries beyond exhaustion, right up until they show signs of structural failure. Any battery showing even the slightest sign of actual failure is almost always well beyond EOL. Sorry to labour the point above on 'EOL' versus 'Failure', but the depths of destruction that the users of Leisure batteries sometimes take them to before they regard them as 'failed', is very different to the industry definition of EOL. Charging systems are designed to cope with batteries within the industry 'fit for purpose window', not a battery with disintegrating Plates that is taken beyond any limits the battery manufacturer ever imagined. We are asked all the time why a Mains Charger/Alternator can't cope with a 'poor' battery, when in their mind 'poor' doesn't mean a 110Ah battery that is down to 82Ah, but one that has warped/shorted Plates, excessive Corrosion or a discharge rate that sees it go flat in a week. One other side point relating to the 'quality' of a battery, it has become very apparent that the budget AGM's are nothing like the construction quality of a big name AGM. Some have exceptionally poor construction. AGM batteries are more difficult to manufacture than Wet batteries, hence the higher cost. Most of the budget AGM's we have seen inside, can be of very poor quality. Some we have seen have not even lasted as long a budget wet battery yet cost nearly double. One study of quality and expensive AGM batteries concluded, "....of almost 25,000 VRLA cells from 9 different manufacturers, the failure rates ranged from 27% to 86%, depending on the manufacturer". To me that reads as though 86% of one manufacturers AGM batteries might fail prematurely (just 14% had a reasonable life) but anothers might suffer 'only' a 27% premature failure rate. That was a survey on very expensive, high quality supposed 20 year life batteries, from 9 different quality manufacturers, so imagine how a budget AGM battery from Platinum Batteries is going to perform? History has shown that even the highest quality AGM batteries won't achieve their quoted cycle life when used as a habitation area battery. Don't expect a budget AGM to make it out of the first camp site. For much of this section we are going to rely primarily on Andrew Goodwin's lifetime work, a document 'Battery - Lifetime Study' published in 2014. The full document can be found further down the page, should you wish to read it in it's entirety, but we are going to Cherry pick some of the findings, some of which go against the generally held views in the Motorhome community. The study was primarily of Lead Acid batteries used in battery backup systems that are generally lightly used and kept at full capacity by a permanent 'trickle/float' charge, just as many Motorhome batteries are kept 'charged up' by long term connection to a Mains Supply or a Solar Panel. Therefore the study has more relevance to Motorhomes than might be first thought. Far more relevant than the usual comparisons made with Car Starter batteries which get virtually no real use. "Recent industry experience indicates that (on a quoted 20 year life battery) a 4 to 7 year VRLA battery life is more likely, regardless of cell size or warranty claims. In one study of almost 25,000 VRLA cells from 9 different manufacturers, the failure rates ranged from 27% to 86%, depending on the manufacturer. These cells were only 3 to 7 years old. The average failure rate was 64% for the entire tested population". That is a 64% failure rate of AGM batteries that didn't make it to even 1/3rd of their expected life. VRLA batteries have been in use in this Industry for many years, longer than in almost any other application. Despite the manufacturers claiming a 20 year life for these very, very expensive batteries, 64% of VRLA batteries didn't achieve even 1/3rd of their 'expected' lifetime. "A European study of over 1,000 installations, of various system voltages and cell capacities, containing about 35,000 cells concluded that VRLA batteries require replacement after 5 to 8 years of operation. Absorbed Glass Matt-type cells demonstrated a higher failure rate than did gel-type cells. It was concluded that 20-year class AGM cells actually have an expected life of 5 years at 25°C (77°F), dropping to about 3 years at 32°C (90°F)". Bear in mind that these are not ordinary '3 year life' High Street AGM's, these are very, very expensive 20 year life rated batteries that lasted as little as 3 years. Grid/Plate corrosion accounted for 86% of all Wet acid battery failures and 59% of failed AGM and Gel batteries. Clearly Grid Corrosion is the biggest issue for all Lead Acid battery types. Controlling Grid corrosion can be a major step forward in improving battery life. That is that Gel and AGM batteries lost so much fluid it destroyed 33% of all this battery type. There is a common belief that Gel and AGM batteries don't lose fluid, so this is a myth firmly dispelled. 'Cell shorts' accounted for 10% of Wet battery failures but less than 1% for AGM/Gel. Thermal runaway happened in 1 of every 100 AGM batteries failures. Thermal runaway usually starts with an AGM battery getting hot and usually ends when it explodes. So now we know why some Batteries fail, lets look at how usage sometimes has a big impact on life. In the 'Leisure' battery market place we see batteries destroyed from incorrect use. This is possibly because there is so much conflicting advice on 12v Lead Acid batteries. The 'Truth About Batteries' - Battery Life report above, has a phrase, "12v batteries are not destroyed, they are murdered", see page 9, the section on "Quantifying Battery Lifetime". An examination of the battery marketplace straightaway throws up two anomalies. The first is that modern '12volt' batteries are actually 13 volts, or close to that, and a modern Leisure battery actually discharged to 12.0v it is pretty much fully discharged, often to the point of suffering damage. The second anomaly is that different technology batteries have different voltage ranges of use, yet this is very rarely ever mentioned, let alone documented. A Gel battery has a voltage range of 13v for full charge, down to 12.5v for 50% discharged. An old style conventional Wet battery has a voltage range of 12.6v for full charge down to 12.1v for 50% discharged. In both cases, just 0.5v difference between full charge and 50% discharged. Apart from the chart below, we have yet to find a leisure battery specialist site, or any information on the web, that makes mention of the differing behaviour of technologies as far as voltage versus discharge state. 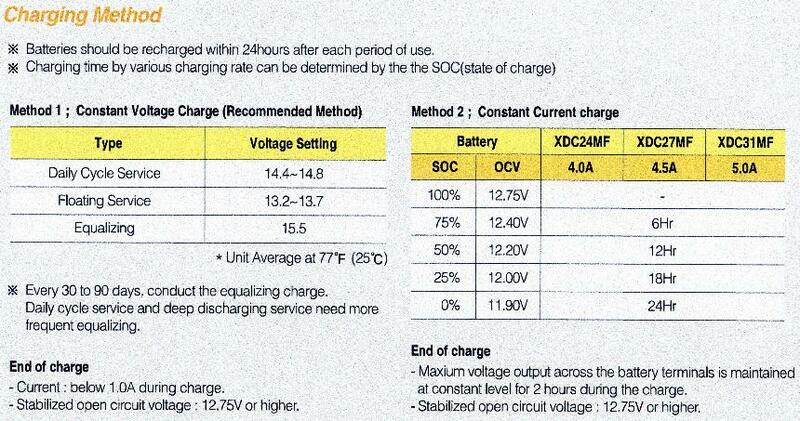 If you look at the chart below from Yuasa, one of the biggest battery retailers in the World, you will note that Sealed/VRLA batteries have a 100% charged voltage of 13.0v. This JPEG below from Atlasbx also shows a State Of Charge (SOC) voltage range that almost exactly matches with the chart above from Yuasa. The differences from different implementation of the technologies in question. See right hand side of photo under Method 2. When they are 75% discharged (only 25% charge is left) it will be around 12.2v. An old fashion Lead Antimony battery has a 100% charged voltage of 12.6v. When 75% discharged (only 25% charge left) it will be around 11.9v. A brand new battery, of any Lead technology, accidentally discharged to a voltage of 12v or beyond 80% is likely to have severely shortened life. Therefore we suggest you understand exactly what battery technology you have installed, and discharge it accordingly. Note that the battery we suggest is used, Varta LFD/Bosch L range, behaves more like a Gel battery in this respect, having a fully charged voltage of close to 13v. 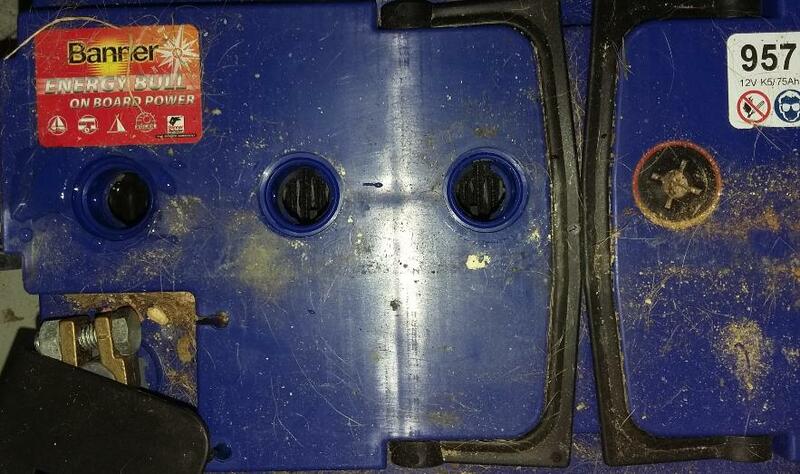 See this photo below of a couple of batteries having been fully charged and rested a few days. The ideal for long battery life, is to discharge a battery no more then 30% Depth Of Discharge (DOD) for optimum life. For a Gel battery that is 12.7v and 12.3v for a Conventional wet battery. You can discharge a battery down to 50%, but it's cycle life can be cut by half, even on a specially constructed Deep Cycle battery. The chart below from Victron Energy shows just how outstanding their batteries are with 4,500 cycle life at 30% shallow discharge. Yet if you look at the chart, you will see that the greater the depth of discharge, the shorter the life, discharging the 4,500 cycle Gel Long Life to 80% 'loses' a massive 3,000 cycles. Yet this is a specialist Ultra Deep Discharge battery. This behaviour is not unique to Victron, who are outstanding in the industry, but ALL batteries from all manufacturers. So Deep discharging a battery can have a massive impact on it's life. Now we know what causes a battery to approach EOL more quickly and the part 'usage' plays in that, so lets look at how they work and relate that back to the failures, to see how we can choose and then care for our batteries. So what is the chemistry that makes a battery work? This will be a brief description of a single lead Cell, 6 of which make up a 12v Battery. When two lead plates are placed in a Sulphuric Acid bath, Voltage will be available if you connect an electrical load to each Lead Plate. Modern Lead batteries are more than just two Lead Plates. Construction varies, but simply, the Negative 'terminal' usually consists of a porous plate of metallic Lead. The “+” plate consisting mostly of porous Lead Dioxide paste, supported on a thin metal grid. As the current flows out of the Cell, a chemical reaction takes place with the Sulphuric Acid that converts both Plates to Lead Sulphate. 'Recharging' the Cell will revert the chemical reaction but some of the material converted to Lead Sulphate will not revert back on each cycle. Sometimes Hydrogen and Oxygen is a by product of the chemical reaction. The more the battery is charged and discharged (Charge/discharge Cycle) the greater the amount of material that will become 'inactive'. Eventually the amount of material that has become inactive will reduce the the battery capacity, but not necessarily to a 'failed' state. A battery in this state might be classed as 'exhausted' with significantly fewer 'amp hours' to surrender on each discharge, but it may not necessarily have failures, such as a Cell 'Short', so may not 'lose charge'. The above Cell description is of Wet/Flooded construction, below is a cutaway of a modern battery. The primary difference between a Wet/Flooded battery and a Gel is that the Suphuric Acid is in the form of a Gel. In an AGM (Absorbed Glass Matt) battery the Acid is 'absorbed' in a Glass Fibre Matt between the Plates. Both these types of battery also generally operate 'under pressure', the pressure helping to recombine any Hydrogen and Oxygen back to Water, to reduce Fluid loss. Therefore, AGM and Gel battery types require a pressure valve to control the pressure inside the battery. These are commonly grouped together as Valve Regulated Lead Acid (VRLA) batteries. They are also sometimes incorrectly referred to as 'Sealed' batteries even though they are able to vent out fluid past the valve. As has been shown from table above, where 33% of GEL/AGM batteries failed from 'Drying Out', it suggests these battery types are far less 'Sealed' than most people realise. They clearly do vent fluid otherwise the batteries would never dry out. Each time any Lead Acid battery is charged/discharged there will usually be Corrosion at the Positive plate. The amount of corrosion can vary depending on how the battery is used and it's construction. Temperature has a significant effect on Corrosion, just a 9 degree rise above 25 degrees can reduce a batteries life by 50%, see page 2/13 in the 'Battery - Lifetime Study'. As noted above Corrosion of the Positive Plate Grid is the Primary cause of failure of all Lead Acid battery types, 86% failure rate for Wet/Flooded batteries and almost 60% for AGM/Gel batteries. Corrosion is dramatically accelerated by faster charging and/or operation at higher temperatures, both Discharge and Charging. The below are two common 'conditions' with batteries, the descriptions of which are lifted from the same Technical Document 'Battery Life Time Work' first mentioned above. Sulphation is an issue that is often mentioned as a cause of battery failure and usually results from Undercharging or leaving a battery in a semi discharged state. This results in a harmful buildup of lead sulfate on the plates, called sulfation. Lead sulfate formed as a result of undercharging is inherently different in structure from lead sulfate formed during normal cell discharge. The lead sulfate formed during normal discharge has a very fine crystalline structure that is easily broken down by charging current. The lead sulfate crystals formed as a result of undercharging continue to grow and eventually reach a size that cannot be easily broken down by charge current. Additionally, the lead sulfate crystals physically occupy more space than the original active material. An excessive buildup of lead sulfate can make the plates warp or buckle. Hydration occurs in a lead-acid battery that is over discharged and not promptly recharged, or a battery that remains in a discharged condition for an extended time (such as might occur during long-term storage). Hydration results when the lead and lead compounds of the plates dissolve in the water of a discharged cell and form lead hydrate, which is deposited on the separators. When the cell is recharged, multiple internal short circuits occur between the positive and negative plates. Once hydration is evident, the cell is permanently damaged. "The float charge process maintains the positive plates in a nearly fully charged condition, in which the active material is all lead dioxide, PbO2, with very little lead sulfate, PbSO4, present under ideal conditions. During discharge, lead dioxide is converted to lead sulfate. However, the chemical reaction is better facilitated when a lead dioxide molecule is located adjacent to a lead sulfate molecule. In other words, the chemical reaction process improves in efficiency as lead sulfate sites are generated. During the initial moments of discharge, the chemical reaction is slightly less efficient, with the result that the voltage can dip to a lower than expected value and slowly recover from this voltage dip during the first few minutes of discharge as these lead sulfate sites are created". One of the issues of VRLA batteries, like Gel/AGM, is that when they deteriorate, debris can obstruct the Valve causing high pressures inside the battery. Sometimes resulting in explosion. VRLA batteries are also documented to be prone to catastrophic failure from 'Thermal Runaway', a phenomenum whereby the battery faults and gets hot, the heat 'fuels the breakdown' which then causes it to get even hotter, so it breaks down faster, etc. Explosion of the battery is usually the end result. While AGM/Gel batteries are often sold as 'Gas Tight' or 'zero Fluid Loss', and allegedly the 'safest of batteries', as Andrew Goodwin's document shows they do lose fluid. Failure can lead to serious consequences. Because of the catastrophic nature in which they fail, we believe Gel, but especially AGM, are the least safe of all Motorhome batteries. There is a huge difference between an AGM battery exploding under the bonnet of a Car where the heavy chunks of battery casing are contained and the Acid spread limited, and one exploding under the Drivers Seat of a Motorhome. For this reason we suggest AGM batteries should never be fitted under a driver or passenger seat or any other vulnerable position in a Motorhome as the risk to life is very real. The risk isn't high, but is there, we have seen 4. Just because a battery retailer tells you an AGM battery is suitable for installation inside a Motorhome, it doesn't mean they are, or that they even half understand how Motorhome habitation batteries are used. Ask anyone who has suffered an exploding battery, just how scary it is. Ask them about the mess and the horrific melting abilities of the Acid, all over every item inside the Motorhome. The damage caused by the acid to curtains, carpets wood/plastic cupboards, ceiling, seats, etc would probably write off a Motorhome. If the AGM wasn't original fit, the Insurance might not honour the claim? Although the battery Failure Chart above lists many 'outright' failures, don't forget that all lead Acid batteries that are healthy, i.e. low corrosion, will still lose capacity each time they are discharged/charged, purely down to the chemistry of a battery. It may hold it's charge and appear to perform as usual, but the amount of power in each cycle will slowly reduce. If you add to the mix Postive Plate corrosion, which in Andrew Goodwin's life time study document is the biggest issue for all battery technologies, the degradation rate will be greater and lost capacity higher. Chemistry and Physics laws say that a battery of 4 years of age that has been used regularly, can not be any where near 100%, regardless of what an owner thinks. So now you know how a battery works and what causes them to deteriorate, go to EOL and fail totally. 1. Batteries deteriorate from use, the lighter the discharge the longer the life. EOL occurs when capacity drops below 80%. At this point the battery may be working perfectly so has not 'failed' outright, but it is described as 'Exhausted'. 2. That AGM and Gel often fall well short of the manufacturers lifetime predictions and that fluid loss is a bigger issue than most realised. They are also not the 'safe' battery option as perceived by many. 3. That Positive Grid Corrosion is the enemy of all Lead Acid batteries and the chief reason for failure of all types. 4. Temperature has a major impact on battery lifetime. Charging or discharging at higher than the manufactures ideal rates will elevate Battery Plate temperatures that may then massively shorten the batteries life. Note that these are the Battery manufacturers 'Ideal' rates for optimum battery lifetime and may be drastically different to the 'Maximum'. One 'badged' large Gel battery we saw recently from a big Solar Solution company had '20amps max charge rate' printed on the casing. 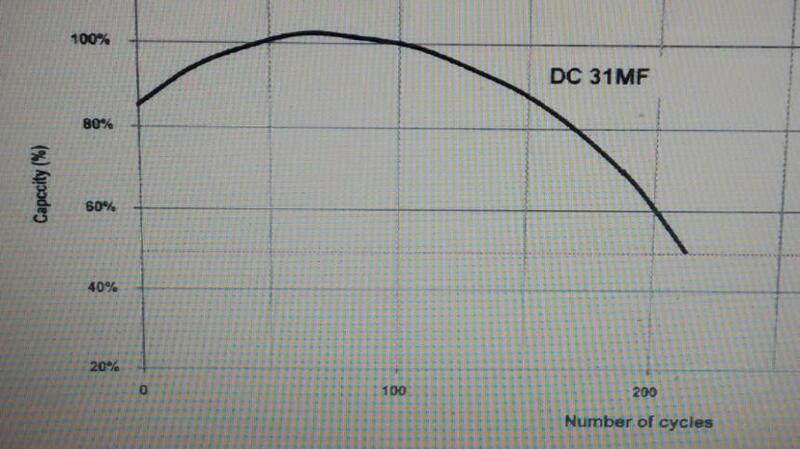 That probably equates to an ideal 5 - 10 amps charge rate to achieve it's rated cyclic ability? The information above should help you decide what works for your situation, which will be unique. The way you use a battery will not be same as anyone else's. Take the time to assess how you use the Motorhome and the battery. Just because Fred Boggins claims to have a battery that cost £12.30p 15 years ago, doesn't mean the same battery will last as well for you, or even that the battery is as good as he thinks. Our suggestion would be to find a Wet/Flooded battery with technology that resists grid corrosion, if usability and long life are your priority. Remeber that when comparing batteries, look in the same price band. A battery that lasts 1.8 times longer than another, but costs more than twice as much isn't a better battery. See`our Battery Technology page for ideas. This Graph below shows how the capacity drops off with use. Note how a new battery (fully charged) may start off with only 85% capacity until it has been charged and discharged a few times. In the case of the battery below it's full 100Ah capacity will not be available until the battery has been charged and discharged around 50 times. We don't know if all batteries behave this way, but no reason to believe they don't. Note that the above is very specific to Motorhome/Caravan Leisure batteries, not old style Car Starter batteries which are used in a very different way. Wet acid Starter batteries do virtually no real work. A couple of times a day the Starter Motor will want a lot of amps for less than a second on most modern cars. The bulk of which will be supplied by the battery with almost no need for any chemical reaction to take place in the battery to provide the power. The Alternator puts back what little power was drawn almost immediately. That is very different to the way a Leisure battery might be slowly drained down half full over several days.